The region of East Asia offers a fertile ground for anthropologists who seek to understand the pulse of a new modernity, whether it be the effects of economic restructuring, new modes of living and being, new ways of relating, technologies and human interfaces, population dynamics, understandings of well-being, the life well lived or the ‘good’ death, mobilities in the region, and much more. 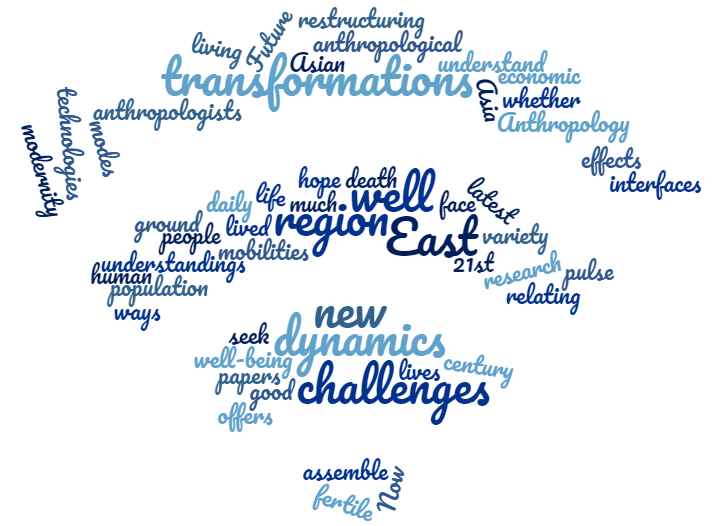 We hope to assemble a variety of papers from the latest anthropological research on the transformations and dynamics as well as challenges people in the region face as they go about their daily lives in the 21st century. to promote anthropology in East Asia. 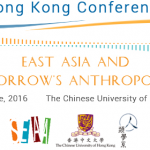 The Executive Committee of the Society of East Asian Anthropology (SEAA) invites proposals for panels and individual papers to be presented at the conference. All presentations are to be delivered in English. Proposals for panels or for individual papers should be submitted to [email protected] before February 28, 2019. Results of the selection of papers will be made by March 31, 2019. A panel will consist of either 3 or 4 paper presenters and 1 discussant (non-presenter); however, double-sized panels of up to 8 papers and 2 discussants will also be considered. To submit a panel, please provide a 200-word abstract for each individual paper and a 200-word statement for the theme of the panel. Only full panels will be considered for acceptance. In middle January an online form to help self-organize panels (interested individual papers seeking fellow presenters to form a full panel) will be hotlinked here. To submit an individual paper, please provide a 200-word abstract. We will cluster together papers that broadly fit theoretically. Junior scholars are given priority. Registration will start on May 1, 2019. Many restaurants near the conference venue are available at lunchtime. A reception, the cost of which will be included in your registration fee, will be held on Saturday, August 3, 2019. I look forward to welcoming you at GSAPS! Ahead of the AAA submission portal details, below, the SEAA is experimenting with an online form for you to post your title and abstract being proposed in order to discover possible co-presenters. Sessions that are seeking an additional presenter, but also individuals looking for others to form a new session, will be able to see what topics are in play during the run-up to the AAA’s submission deadline. Enterprising individuals or session chairs can use the online form to discover others to work with. After the AAA’s submission deadline closes and final program decisions are made later in the summer, then the SEAA will again experiment by posting those finalized titles and abstracts online so that Annual Meeting attenders can look ahead to the presentations. And those who can’t be in San Jose in person can also get a glimpse of the line-up, or enter into correspondence with some of the presenters. As well, this online experiment will serve as a kind of archive as years go on. 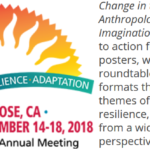 The Society for East Asian Anthropology (SEAA) welcomes proposals for the 117th American Anthropological Association (AAA) Annual Meeting, to be held in San Jose, CA from November 14-18, 2018. Proposals submitted to SEAA for review should explore issues of contemporary anthropological importance and relevance concerning East Asia (including China, Japan, Korea, Mongolia, Taiwan, Hong Kong, other areas of the world with historical or contemporary ties to East Asia, and diasporic societies/cultures identified with East Asia). All presentation types are welcome, but note that organized panels (such as the oral presentation sessions and the roundtables) have a greater likelihood of being accepted on the program. Individually volunteered paper and gallery submissions will be grouped together by the SEAA program committee into cohesive sessions if possible; these sessions will then be evaluated by both the SEAA as well as the AAA’s Executive Program Committees. The deadline for submission is Monday, April 16 at 3:00 pm EDT (no new submissions will be accepted after 2:00 pm EDT). You must also register and pay for the 2018 AAA Annual Meeting before this deadline. The online submissions system has been problematic in the past, so please submit your proposals as soon as possible to avoid any potential technical issues. We look forward to receiving your submissions and hope to see you in San Jose! The Executive Committee of the Asian Studies Conference Japan (ASCJ) invites proposals for panels, roundtables, and individual papers to be presented at the Twentieth Asian Studies Conference Japan. The conference will be held at the International Christian University (ICU) in Tokyo on Saturday and Sunday, July 2-3, 2016. All presentations are to be delivered in English. The deadline for proposals is October 15. Results will be announced by late December. Panels are proposed by a group of scholars around a common subject. A complete panel includes up to five participants, three or four paper presenters and one or more discussants. Panel proposals should include a 250-word (maximum) abstract from each participant as well as a 250- word (maximum) statement that explains the session as a whole. Only complete panels will be considered for acceptance. Roundtables offer an opportunity for participants to discuss a specific theme, issue or significant recent publication. A maximum of six active participants is recommended. While a roundtable proposal will not be as detailed as a panel proposal, it should explain fully the purpose, themes or issues, and scope of the session. Individual papers give scholars an opportunity to participate in the conference even if they are not able to put together a complete panel. Since only a limited number of individual papers can be accommodated, preference will be given to junior scholars. Applicants have a better chance of acceptance as part of a panel. The Executive Committee encourages members to submit proposals that, by focusing on more than one region or by drawing on more than one discipline, will attract a broad range of scholarly interest. Suggestions for innovative alternatives to the panels, individual papers and roundtables described above are also encouraged. The Executive Committee also strongly encourages graduate student participation, and will give favorable consideration to panels that include junior as well as senior scholars. From 2014 the ASCJ initiated a Graduate Student Paper Prize. For details on this competition please see the ASCJ webpage. To be considered for this prize the student must be enrolled in a degree program at a Japanese university and present the paper at ASCJ 2016. The deadline for submission of the completed paper is June 14, 2016. The winner will be announced at the time of the keynote lecture. Everyone worldwide interested in Asian Studies is invited to participate. Unfortunately we cannot provide visa support, and can only draft letters of invitation for participants scheduled to present papers at the ASCJ. SEAA has had great success in hosting meetings independent of AAA sessions at the Annual Meeting. Deadline for registration is Dec. 1. After the program is announced in January, the conference registration will begin and accommodations will be arranged. Consider presentations you can make or panels to join in. Please, also invite colleagues near and far to participate. Asian Highlands Perspectives (AHP) is seeking articles and book reviews for its sixth annual collection of essays. AHP is a peer reviewed, open access, trans-disciplinary journal focusing on the Tibetan Plateau and surrounding regions, including the Southeast Asian Massif, Himalayan Massif, the Extended Eastern Himalayas, the Mongolian Plateau, and other contiguous areas. Cross-regional commonalities in history, culture, language, and socio-political context invite investigations of an interdisciplinary nature not served by current academic forums. AHP contributes to the regional research agendas of Sinologists, Tibetologists, Mongolists, and South and Southeast Asianists, while also forwarding theoretical discourse on grounded theory, interdisciplinary studies, and collaborative scholarship. AHP welcomes a wide range of submissions from those with an interest in the area. Given the dearth of current knowledge of this culturally complex area, we encourage submissions of descriptive accounts of local realities especially by authors from communities in the Asian Highlands as well as theory-oriented articles. We publish items of irregular format long articles, short monographs, photo essays, fiction auto-ethnography, etc. Authors receive a PDF version of their published work. Potential contributors are encouraged to consult previous issues. For more information on AHP, visit http://plateauculture.org/asian-highlands-perspectives. SEAA is committed to developing international channels of communication among anthropologists throughout the world. We hope to promote discussion and share information on diverse topics related to the anthropology of Taiwan, PRC, Hong Kong, Japan, Korea; other societies/cultures of Asia and the Pacific Basin with historical or contemporary ties to East Asia; and diasporic societies/cultures identified with East Asia.